How very sad, I\'ve read a lot on this mine online but have never seen firsthand accounts of it due to the restrictions. 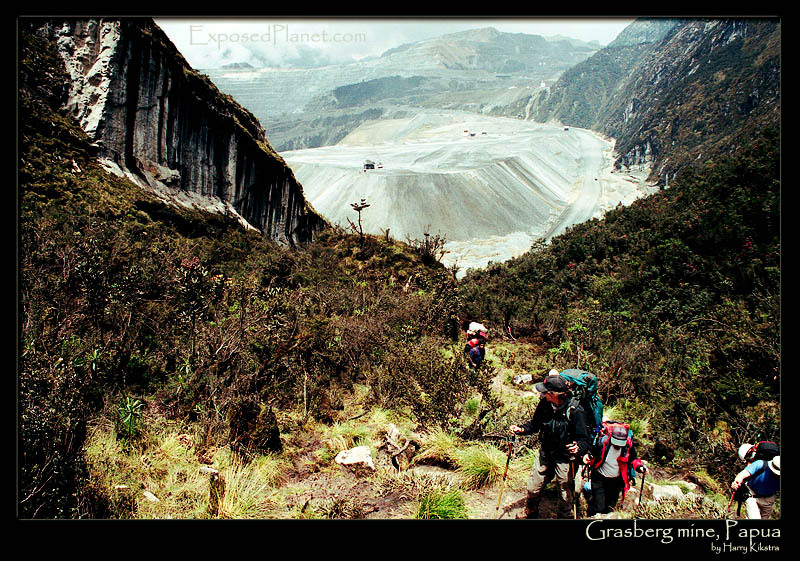 The story behind "Grasberg mine near Carstensz Pyramid, Papua"
Carstensz Pyramid is the highest mountain of Oceania, named after Dutch sailor Jan Carstensz who saw the snowy mountains in 1623. The first western explorers were also Dutch, climbing the then higher nearby peak Ngga Pulu. But since then the snow has melted so much that now rocky Carstensz Pyramid is higher. One of the geologists of the 1936 expedition, Dozy, filed a report about the rocks and soil he gathered at “Ertsberg” (Dutch for “ore mountain”), filled with copper. It disappeared in a library and went unnoticed due to the 2nd World War, only to be rediscovered 20 year later by a geologist of the Freeport mining company. The rest is history, just like Ertsberg itself and as you can see here, also the follow-up mine of nearby Grasberg (“Grass mountain”) is nearly history, the mountain has virtually disappeared due to the growing demand of copper and gold and money in general. On this Nasa picture (link) you can see the direct impact the huge mining pit has on the landscape as well as the diminishing glaciers, one of the last on the equator. What is less visible is the ecological disaster of this largest goldmine in the world, a stream of toxic residue has wiped out most life downstream to the sea. Freeport company pays the local Indonesian Army and therefore the original inhabitants of Papua see nothing from the $$$ of this mine and get chased away from their own soil and even killed. Read more on these links about one of the largest but most forgotten man-made ecological and cultural disasters. Shot in 1999 with Eos 500n on kodachrome film, at the start of our expedition. At that time the mine access road could still be used to get near the mountain, currently the mine has revoked all permission as they do not like people reporting on these issues. Carstensz Pyramid, one of the ‘7 summits’ might be in danger itself, though it is just inside a national park, underground mining shafts seem to be very close if not directly underneath the mountain.